24-hour forecast: Sunny today and partly cloudy and windy tonight with the chance of only brief isolated showers. Mostly sunny tomorrow with only isolated showers developing. Winds: East at 15-25 knots. Today: Winds: East 15-25 kt. ; seas: Rough. ; waves: 5-7 ft.; isolated showers or thunderstorms. Tomorrow: Winds: East 5-15 kt. ; seas: Choppy. ; waves: 3-5 ft.; a few showers/ isolated t-storms (mainly south). Marine Outlook: Monday night:- winds: East 5-15 kt. ; seas: Choppy-mod; waves: 3-5 ft.; a few showers or thunderstorms (mainly south). General Outlook: For Monday and Monday night is for cloudy spells with a few showers and isolated thunderstorms mainly over the south and along some coastal areas. 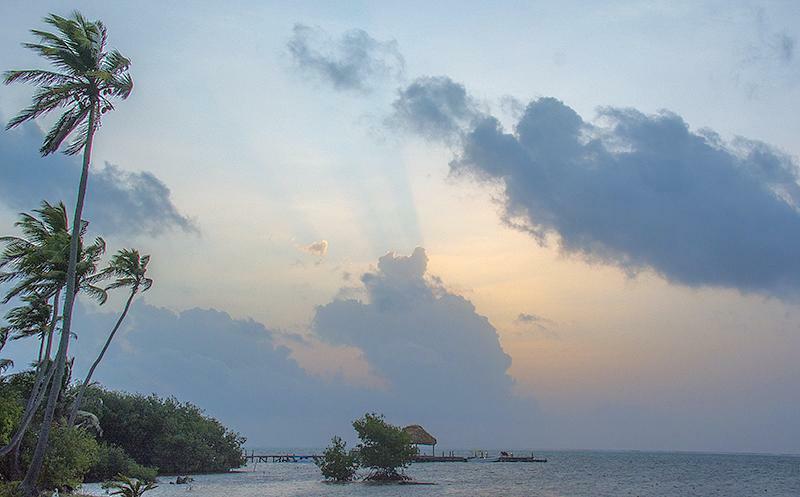 Calm and clear on Ambergris Caye this Sunday morning with an expected high of 88. The Tropical Waves are disintegrating. The Saharan Dry Air is intensifying. I have suspended all attempts to do any planting in my garden. The ground is returning to dry season conditions.
? but the forecast has rain every day. What am I missing? There were a few isolated rain showers in the southern mountains last night.... This morning there is a weak line of rain moving in across Belize from the Caribbean, causing a few showers in several, isolated areas of Belize. . .. . The upper cloud is very thin, but we are getting Caribbean puffy clouds rolling in. .. Generally it will be a sunny day but with significant clouds, and the possibility of occasional small rain showers in a few locations.